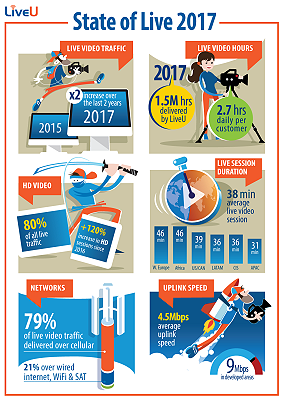 LiveU: massive increase in live IP video transmissions. 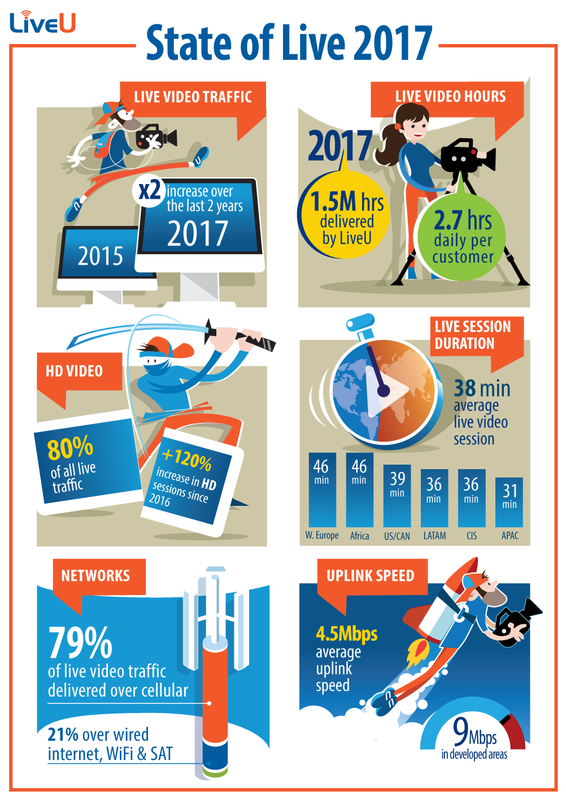 Hackensack, NJ, December 2017: [Source: LiveU] LiveU has offered new insights into the massive growth in live IP video traffic in the broadcast market, reflecting the transition away from traditional satellite transmission towards cellular. Based on data from LiveU’s global customer base (over 2,000 customers in over 100 countries), the findings reveal the full extent of the surge in demand for live content, geographical differences in video acquisition behavior, the move to HD and more. LiveU’s data shows the reliability of bonded cellular with 79% of all bonded video now delivered over cellular networks only (wired internet connection, WiFi and satellite accounting for the remaining share).